Blockchain technology has emerged as the most innovative technology of the recent time and soon going to revolutionize the world. Basically, it is a continuously growing list of records, called blocks, which are linked and secured using cryptography. Each block typically contains a cryptographic hash of the previous block, a timestamp, and transaction data. As this is so intuitive, engineers can also take advantage of it and make their final year project on Blockchain Technology. In this article, we are going to discuss few of the projects, which can be made with the help of Blockchain. You can also subscribe to FINAL YEAR PROJECT'S by Email for more such articles. Blockchain is not limited to Bitcoin and other cryptocurrencies. It can be used wherever transactions are involved. This brings security and transparency. So, below are some of the projects which can be implemented using Blockchain technology by engineers and you can also try them using in your final year projects. Engineers are vital after a large-scale calamity such as hurricanes, earthquakes, and floods where an immediate and comprehensive accounting of structural integrity of buildings, physical infrastructure and public hazards is required. This is a very innovative project which deals in moving complete municipal cooperation data to the blockchain. Every government organization has huge databases and records with public information which needs maintenance and security. So this blockchain project is a modern way of using public ledger which will use multi-agent algorithmic game mechanics to help communities self-regulate shared public assets. With the increase in the growth of digital music industry, companies are facing issues with the collection of royalties easily. In this project, students focus on mitigating this issue by creating a reliable database for the complete music industry. For this, they created a blockchain reuniting data from different copyright companies and international identifiers referencing sites. All information contained in this ledger benefit from the security and trust brought by blockchain. Recruitment is another good sector where blockchain technology can be used. There are many times when there is mass hiring and mass layoffs. During such cycles, permanent employees may be badly impacted by the workload volatility while the wider communities may struggle with external economic shocks resulting from these swings. So this novel blockchain approach was developed for decentralizing and validated pools of ‘liquid’ knowledge assets for rapid deployments, decreased volatility, and predictive allocation. This is another sector which is thriving and needs attention. Smart cities and smart houses are in fashion and thus all this can be blockchained. The student can focus on building system which can manage all the real estate related contracts through blockchain technology. This would definitely increase security and will provide more efficiency. Polypropylene (PPR) is often considered the scourge of landfills and environmentalists the world over for its ability to remain inert for up to 10,000 years. A blockchain application would provide the economic incentive and accounting system to create this clean polypropylene industry. Do let us know what you think about above blockchain projects and if you have any other related project in your mind, do let us know through your comments. 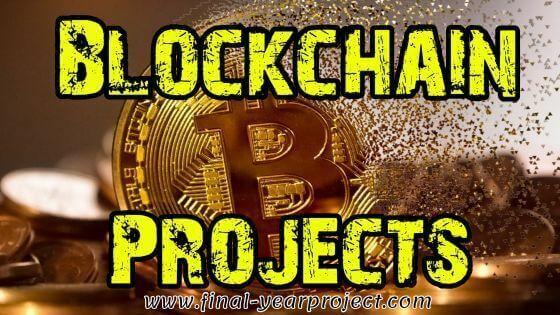 We will keep this post updated with the latest final year projects on blockchain technology, so subscribe to our blog for free and keep getting latest projects. Great implementation of blockchain technology. Thanks for sharing this.